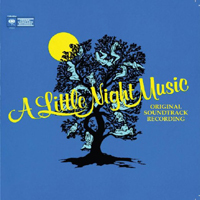 Original London Cast, 1975 (RCA) (3 / 5) This recording boasts fewer legit voices than the Broadway album, with even some of the Liebeslieder singers falling short in this regard. Joss Ackland simply lacks the vocal goods for the role of Frederik; the key of ”You Must Meet My Wife” has been lowered for him, but he’s still unable to sustain the high notes for more than one beat, and he sounds perfectly awful in “It Would Have Been Wonderful.” As Anne, Veronica Page sings prettily enough except above the staff, where her voice thins out and becomes unpleasant. David Kernan sounds fine as Carl-Magnus, as does Terry Mitchell as the tormented Henrik. Although Maria Aitken has even less voice than Patricia Elliott of the original Broadway cast, her contribution to “Every Day a Little Death” has much more emotion to it. Jean Simmons is lovely as Desirée, her “Send in the Clowns” very persuasive. Finally, Diane Langton rather thrillingly belts “The Miller’s Son” in a higher key than her Broadway predecessor, D’Jamin-Bartlett. Gingold is back as Mme. Armfeldt, and very welcome. The orchestrations are the originals for the most part, but this version of Fredreik’s “Now” includes some clever little brass and woodwind interjections that are not on the Broadway album. — M.P. Film Soundtrack, 1977 (Columbia/Sony) (4 / 5) A film that might have been beautiful was botched due to poor direction (by Hal Prince, who had helmed the original Broadway production of A Little Night Music but was not known as a film director) and other major flaws, most notably the casting of Elizabeth Taylor as Desirée. The movie was also sabotaged by moving the action from Sweden to Vienna, Austria, with some of the characters renamed to conform to the new locale. (Given this score’s many waltzes, the switch to Vienna may not sound like a bad idea, but it just doesn’t work.) 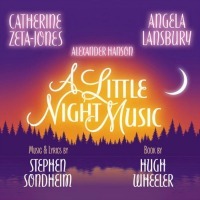 The film does include a brilliant new version of “The Glamorous Life” for Fredrika, winsomely sung by Elaine Tomkinson (dubbing for Chloe Franks), but since that track is now to be found as a bonus item on the original Broadway album, you don’t need to buy the soundtrack recording to get it. Weirdly, Tomkinson also dubs Anne Egerman’s songs for Lesley-Anne Down. She does a fine job in both cases, but the fact that one singer ghosts two separate roles indicates how misguided the film is in general. Better than expected is Taylor’s rendition of “Send in the Clowns”; her singing voice is fragile, but that adds to the character’s emotional vulnerability as expressed in this famous song. (Taylor’s singing is also dubbed by Elaine Tomkinson in the rewritten opening number, “Love Takes Time” and, it seems, for Desirée’s final line in “You Must Meet My Wife.”) A major plus here is Diana Rigg, a fabulous Charlotte. Not only does she act the character’s songs more fully than those who preceded her in the role, Rigg sings them better, too. Len Cariou and Laurence Guittard recreate their original roles but rein in their big voices for the film medium, so you’ll probably enjoy them more on the Broadway album; also, Carl-Magnus’s “In Praise of Women” was cut from the movie and is not included on this album. Among the other great songs missing here are “Liaisons” and “The Miller’s Son.” Gingold is back once again as Mme. Armfeldt, but with “Liaisons” gone, she doesn’t have much to do. — M.P. 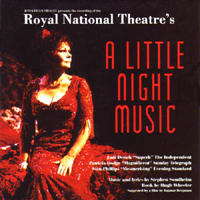 Royal National Theatre Cast, 1995 (Tring) (2 / 5) This recording features two major, controversial additions to the score: Fredrika’s extended solo version of “The Glamorous Life,” a highlight of the Night Music film, and Charlotte’s “My Husband the Pig,” which was cut from the show before it opened on Broadway. Trying to shove these songs into the show score is questionable to begin with, and it’s done here with a consummate lack of skill. Fredrika’s “Glamorous Life” is broken up into sections that are interrupted by bits of the original version sung by Desirée, Madame Armfeldt, and the Liebeslieder singers, while “My Husband the Pig” is stuck into the middle of Carl-Magnus’s “In Praise of Women.” It’s surprising that Sondheim allowed any of this; the “Glamorous Life” conglomeration, in particular, is hard to listen to because it contains several bizarre modulations of key. The best thing about this album is Judi Dench, stellar in the role of Desirée. Her performance of “Send in the Clowns” is truly special, most noteworthy for the bitterness and anger that she stresses in the song’s mix of emotions. Laurence Guittard, the original Count Carl-Magnus, has here graduated to the role of Frederik, which he sings very well, while Carl-Magnus is capably sung by Lambert Wilson. Other accomplished principals are Joanna Riding as Anne, Patrica Hodge as Charlotte, Issy van Randwyck as Petra, and Siân Phillips as Mme. Armfeldt. The fly in the ointment is Brendan O’Hea as Henrik, screaming the high notes that are so beautifully rendered by Mark Lambert on the original Broadway cast album. — M.P. 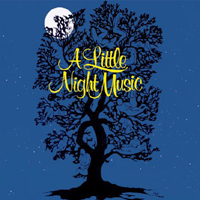 Broadway Cast, 2009 (PS Classics, 2CDs) (1 / 5) While this recording is mostly unsatisfactory in its own right, by no means does it make clear just how far off the mark was the 2009 Broadway revival of A Little Night Music, disastrously misdirected by Trevor Nunn. The visual component of Nunn’s staging is, of course, absent here; nor are we subjected to David Farley’s all-wrong scenic design. 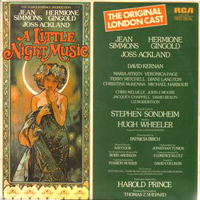 The tiny “orchestra” heard on the album, though still completely inadequate for Sondheim’s glorious score, is slightly augmented in size from the pitifully minuscule group that was employed at the Walter Kerr Theatre for this production, and the general inwardness of the cast’s performances is less damaging on the recording than it was live; listen, for example, to Catherine Zeta-Jones’ and Alexander Hanson’s hyper-intimate reading of the Desirée-Frederik dialogue scene before “Send in the Clowns.” Even the one piece of miscasting among the leads, Aaron Lazar as Carl-Magnus, isn’t a major problem here, because he was wrong for the role more in terms of physical than vocal type. Somehow holding their heads above water, Zeta-Jones, Erin Davie, and Leigh Ann Larkin are quite good overall as Desirée, Charlotte, and Petra respectively, while the great Angela Lansbury manages to be one of the best-ever Mme. Armfeldts, helped by the inclusion of so much dialogue on the recording. Faring less well due to Nunn’s misguidance is Ramona Mallory with a weird characterization of Anne, although the beauty of her singing voice is happily very much in evidence. (Ramona is the daughter of Victoria Mallory and Mark Lambert, the original Broadway Anne and Henrik.) There are sections of Henrik’s music in which Hunter Ryan Herdlicka demonstrates that he does have the vocal chops for the role, so it’s a pity that he was directed or allowed to deliver the high notes in “Later” and “A Weekend in the Country” in a blaring straight tone, presumably for “effect.” That choice may have been foisted upon Herdlicka by Nunn or by musical director Tom Murray, whose leadership is lacking in that he permits or encourages the cast members to futz with phrasing and to indulge in a fair amount of speak-singing — always a big mistake in a Sondheim score. The Liebeslieder singers have gorgeous voices, and once past the somnolent beginning of the “Night Waltz” that opens the recording, they sound wonderful throughout. — M.P.